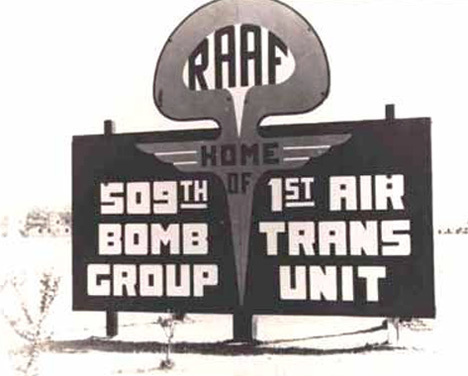 Roswell Army Air Field (RAAF) sign in 1946.Walker Field was 8 miles south of Roswell. Photo source: USAF Historical Research Agency. 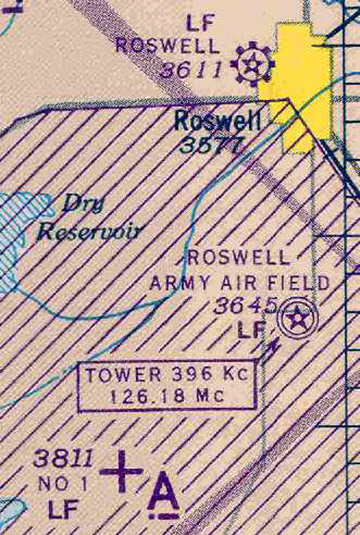 1944 aeronautical chart of Roswell, New Mexico (yellow) eight miles north of Roswell Army Air Field and its additional Auxiliary No. 1 air field in lower left. Historic map source Chris Kennedy. December 23, 2011 Springfield, Massachusetts - On December 1st, I received an email from 57-year-old Patrick Amp L. Murphy, who served as an FB-111 Bomber Crew Chief and Inspector for the 509th Bomb Wing at Pease Air Force Base in New Hampshire after duty in Vietnam. Patrick worked with the 509th Bomb Wing from January 1973 to May 1975. His father, Francis R. Murphy, born in Springfield, Massachusetts in 1905, had enlisted in the U. S. Army in 1940. During World War II, he was promoted to Captain and was assigned to the 8th Army Air Corp with an intelligence unit on the front lines. He worked in North Africa desert wars and then was in Naples, Italy, until the war ended in 1945. Captain Murphy was wounded four times, received four purple hearts and a bronze star. From Italy, Capt. Murphy was assigned to Roswell Army Air Field, New Mexico, in late 1945 through 1947 to early 1948. Previous PostPrevious Updated: Asteroid YU55 “Puzzling Structures”: Equatorial Ridge and Tall, “Pointy” Hill?